The Acer neoTouch is the third smartphone we've seen from the company since it acquired phone manufacturer E-Ten last year, and the first to feature the Windows Mobile 6.5 OS. 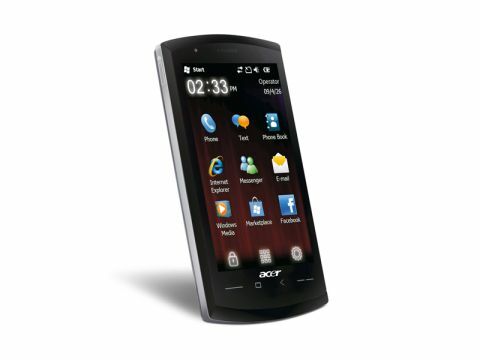 The front of the handset is dominated by the 3.8-inch display, with a robust glass coating that offers a quality feel. With a resolution of 480 x 800 pixels, it's a sharp screen, and colour reproduction is very impressive. Most of the phone's functions are carried out using the touchscreen, with a stylus stored in the top right corner. The Windows Mobile 6.5 operating system is better than older versions of Windows Mobile, with larger, finger-friendly icons and more intuitive menus, but delve a little deeper and you'll still find lots of tiny options where you'll need small fingers or to use the stylus. It also lacks the slickness and aesthetic appeal of rivals such as Google's Android OS, although at least the phone's 1GHz processor makes it a fast and responsive device. The onscreen keyboard is fine for short text messages, but it lacks the excellent text correction software found on rivals such as the iPhone, HTC Magic and HTC Touch Diamond 2. As such, you'll have to prod very precisely at the small onscreen buttons, otherwise mistakes are frustratingly easy to make. Wireless connectivity is impressive, with 3G/HSDPA, Wi-Fi and Bluetooth all built in as standard. These let you browse the internet on the move and also connect to home and office networks. Google Maps software comes preinstalled and, with assisted GPS included, you'll also be able to use the neoTouch as a satellite navigation device. Other pre-installed software includes Office Mobile –with portable versions of Word, Excel and Powerpoint – letting you get to grips with work applications on the move. Acer has stuck with Microsoft's Internet Explorer's web browser, rather than the excellent Opera browser found on other smartphones. That said, the large screen still makes it easy to browse the web wherever you are. The 5-megapixel camera features a dedicated shutter button on the side, automatically switching the phone into landscape mode for shooting. Image quality is disappointing, however, with colours lacking vibrancy and noise present in darker conditions. That said, there is a bright LED flash, helping slightly with night-shots. The 256MB of user memory is limited, but there's also a microSD card to add further storage space. Those adding memory cards to store their music collection will be happy to find the inclusion of a regular 3.5mm headphone jack – making it easy to use your own headphones. Battery life is disappointingly average, lasting for only a couple of days between charges under moderate use. Overall, the neoTouch S200 isn't a bad phone. It is well made and offers a large screen, but with few stand-out features, it's difficult to recommend over the best in class.